My full name is…(e.g. Tsung-Ming Wang) and I’m writing to request a name change for my TOEFL iBT account. I took the TOEFL iBT on…(date) and my registration number is…(ETS ID number). Before the test/After the test, I discovered that the order of my name in my TOEFL iBT account is different from my name on my passport. My first name is…(e.g. Tsung-Ming) and my last name is…(e.g. Wang). Please help me to change it to the name in my passport. I have also attached a scan of my passport for your reference. My name is…(e.g. Tsung-Ming Wang) and I’m writing to report a problem with Test Center STN ****** (test center ID). I took/was supposed to take the TOEFL iBT on…(date) and my registration number is…(ETS ID number). Before my test,/During my test,…(problem). The test administrator…(actions that test administrator took) and told me to…(actions the test administrator told you to take). The administrator’s name is…, and their test center local contact number is 886…(number). Their email is…(email address). This problem caused me to…(effect) and I request a free voucher so I may take the test again. My full name is…(e.g. Tsung-Ming Wang) and I’m writing to inform you that my credit card has been mistakenly charged. 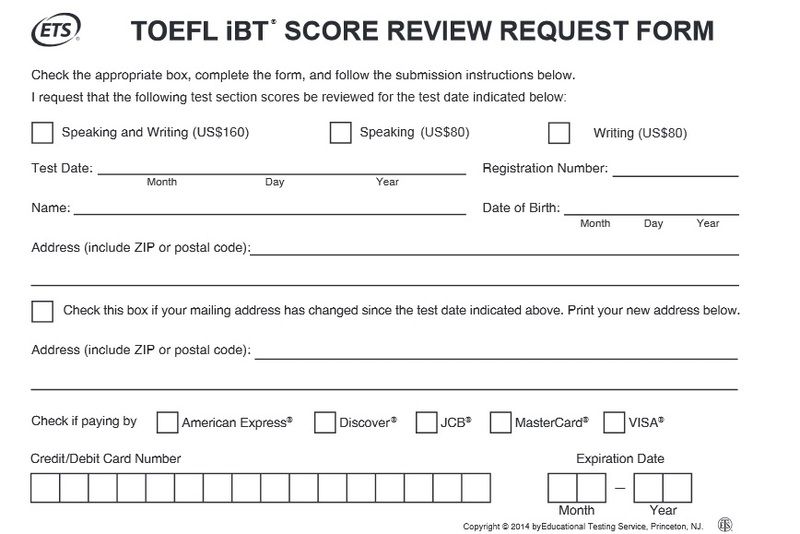 I registered for my TOEFL iBT on ______________ (date) for the exam on ______________ (date). However, there was a problem with the connection and the webpage did not inform me that the registration was successful. Then, I registered again and this time the registration it was successful. I checked my TOEFL iBT account and there was indeed one confirmed order, but my bank informed me that I was charged twice. I have also attached a screenshot of my order and screenshots of my bank account, which shows my card being charged twice. If there is any other evidence I need to provide, please do not hesitate to contact me.